Latest forecast data estimates 1 billion smartphones will be used by the end of 2013. Likewise, tablet PCs continue to replace desktop PCs. With the increase of such personal mobile devices, the popularity of third-party-applications, mobile apps, is strongly growing. However, each of these apps establishes its own communications link to the Internet. Knowing that data performance based on UMTS/HSPA, CDMA2000® and certainly LTE has been greatly enhanced over recent years, it is essential to understand the impact of these applications on the end-user quality of experience (QoE). This webinar will illustrate the implication of applications installed on a smartphone or tablet PC in terms of number of IP connections, list of protocols including protocol name resolution, TCP performance and data volume statistics. 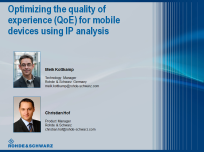 It further outlines how QoE can be optimized by applying IP analysis and protocol statistics functionality using leading test and measurement solutions from Rohde & Schwarz.